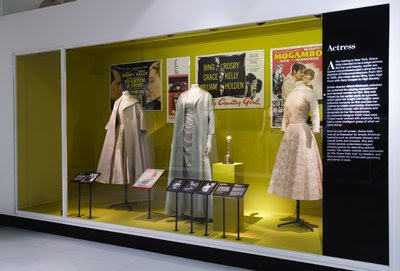 If you're in London these days, you are just in time to view the spectacular wardrobe of Grace Kelly, one of the most popular actresses of the 1950s, which will be on display at the V&A until September 26. Featuring dresses from her films High Society and Rear Window, as well as the gown she wore to accept her Oscar in 1955, the display examines Grace Kelly’s glamorous Hollywood image and enduring appeal. It also explores the evolution of her style as Princess Grace of Monaco, from the outfit she wore to her first meeting with Prince Rainier in 1955 to her haute couture gowns of the 1960s and ‘70s by her favourite couturiers Christian Dior, Balenciaga, Givenchy and Yves St Laurent. There is a wide range of events at the V&A to complement the exhibition, including films screenings, a film and fashion study day, a short course on 1950s haute couture and practical worshops making Grace Kelly-inspired hats and scarfs. You may just make it to one of these. If any of you have been to visit this exhibition, perhaps you'd like to send us your comment about it. I wish I was there to see it in person! Hi there-great new look blog and thanks for the shout out on the exhibition too, it looks stunning! !